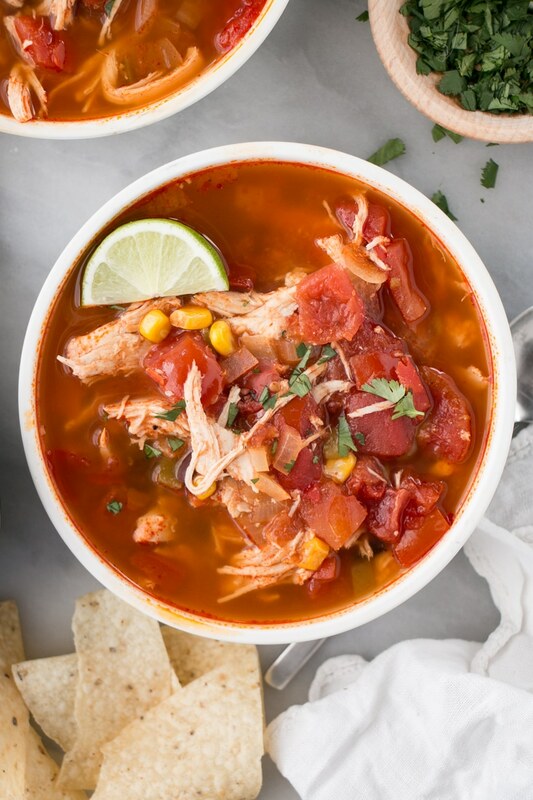 Hearty, flavourful, and nourishing Slow Cooker Chicken Enchilada Soup. A true set it and forget it dinner recipe the entire family will love. 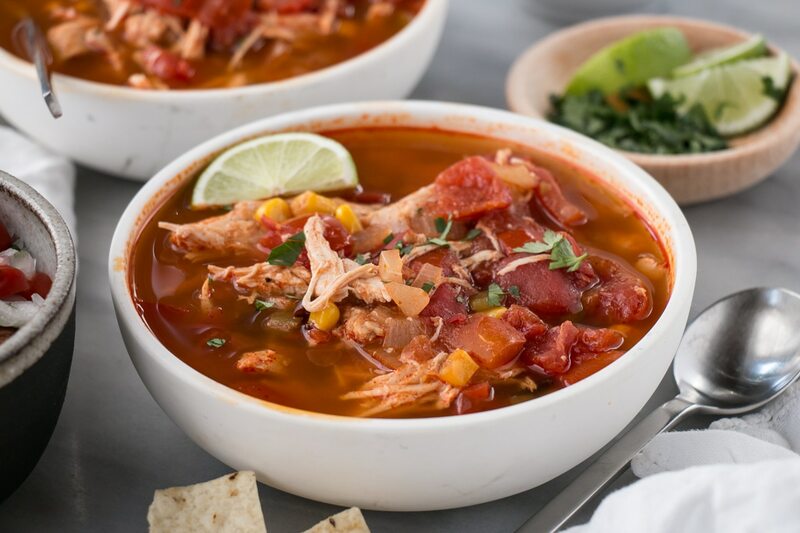 The easiest wholesome soup that can please the entire family has to be this Slow Cooker Chicken Enchilada Soup. It takes only 10 minutes of prep and has a healthy base of chicken breasts and vegetables like tomatoes and corn. These types of meals work so well for us because it has a little bit of everything for each person in the family. From tortilla chips to extra guacamole (always room for more guac, am I right?) 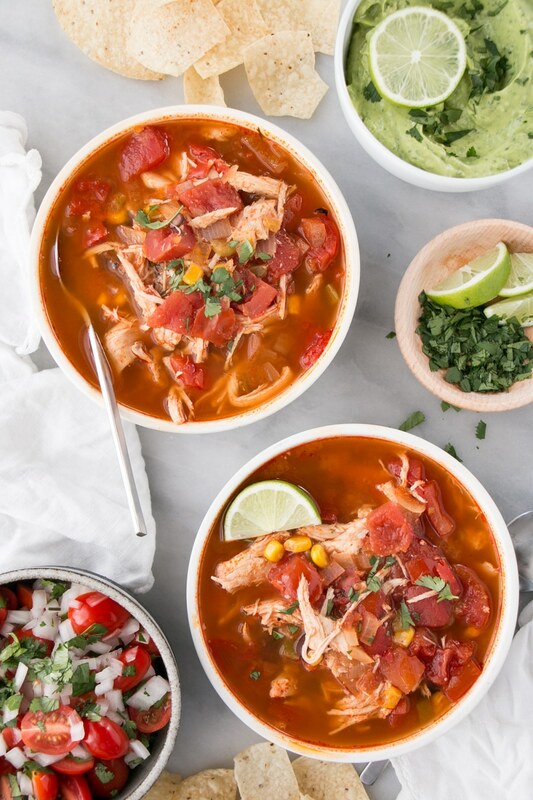 to a vibrant fresh chunky salsa, this soup becomes a bright, delicious, and hearty meal. As the person preparing the meal, I love that this dish has very few ingredients and yet delivers on great flavour. It’s prefect for literally tossing the ingredients into the slow cooker, setting it and forgetting about it until dinner rolls around. Garnishes all the way! 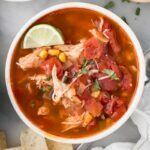 This Slow Cooker Chicken Enchilada Soup has a ton of great flavour and is wholesome on its own, however I like serving this soup with a chunky homemade salsa and a cilantro packed guacamole. Both the salsa and guacamole are fresh vegetable and fruit based with little else, so it is literally adding more veg to veg. Other ideas include lime slices, chopped cilantro, pickled red onion, sour cream, chopped avocado. grated cheese, and a fun one for kids – tortilla chips. The chips work well for scooping up the chunky pieces of meat. Do you have a favourite set it and forget it easy slow cooker recipe? We want to hear from you. I’d love to know which are your favourites that your family turns to frequently. 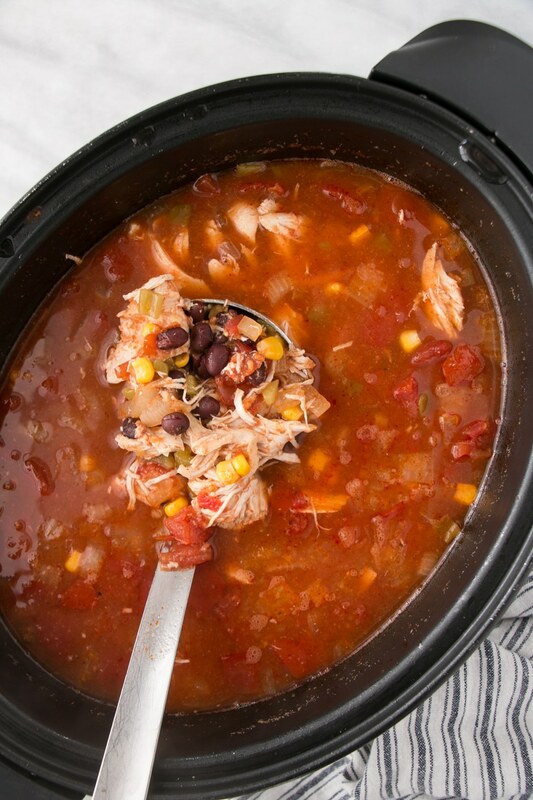 Place all ingredients in slow cooker (or large oven-proof pot with lid). Cook on high for 3-4 hours or low for 6-8 hrs. Remove chicken from soup and shred. Return chicken to pot. 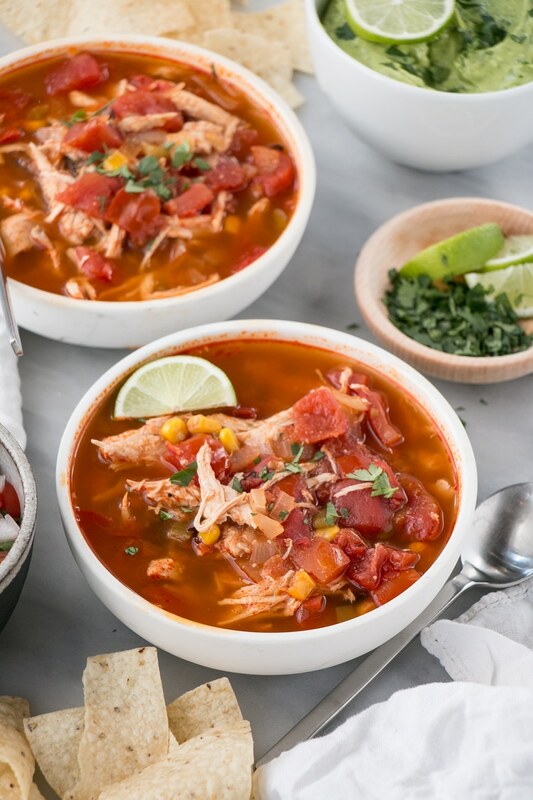 * This soup is freezer friendly for about 2-3 months. Yum! This is right up my alley!